Have you ever noticed how one small detail in something can make all the difference — like a certain ingredient in your favorite recipe? Incorporating glass tile into the pool is kind of like that. Without it, it looks fine, but with it…it stands out above the rest. Using glass tile for the pool waterline is a popular design trend these days because of its unmatched versatility and durability. According to experts, glass tile can maintain its appearance and surface integrity almost indefinitely. In other words, it’ll never get old and never lose its luster. There are a number of ways to incorporate the 2-by-2 or 1-by-1-inch tiles into the pool. 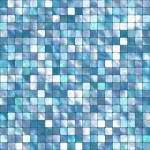 You can create a specific pattern or design a mosaic with custom colors. The spectrum of color is pretty much infinite, as is the result you’ll get in the water and out. Glass tile is such a popular choice for waterline tile because it creates a much more dynamic effect than standard ceramic tile and truly gives the pool a distinct look at different times of day. And many designers use at least two to three colors when creating a tile mosaic because of the illusion they project within the water. The beauty of glass tile is that each tile is a small part to a larger whole. Individually the tiles look beautiful, but together they create a masterpiece in the pool. Turn your pool from ordinary to luxury with a custom look today.